Is that new page of content driving more lead forms? Is this month’s home page banner driving more free trial sign-ups? 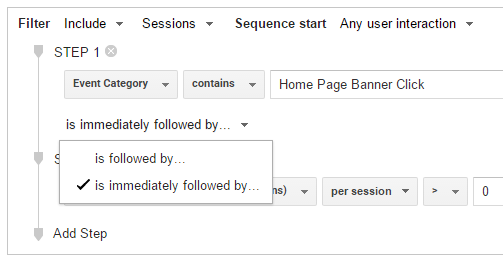 Use sequence segments in your Google Analytics data to make sure you’re getting the right answers. It’s easy to get them wrong. The questions sound simple. The “obvious” answers, however, often lead nowhere or worse than nowhere. The table shows (89) conversions – none attributed to any page. It’s because goal numbers go with session dimensions, things that apply equally to all of a user’s activity during a session – such as source or campaign or device. Pages and events are hit dimensions, things that apply only to part of a session. 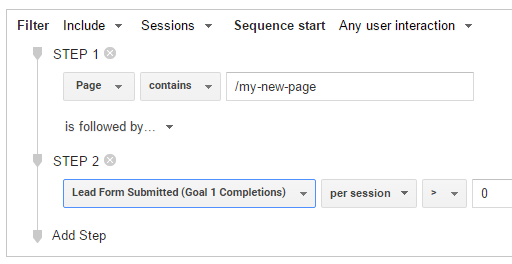 For example: If a session had 3 page hits and only 1 goal completion, but Google Analytics built a table with 1 goal completion for each page hit, then we’d end up with 3 goal completions for the session! Google Analytics doesn’t build tables that way. Putting utm tags on your home page banner. Don’t do it, you’ll inflate session counts AND lose the original source of any conversions! You certainly can apply a custom segment to any report with goal data. But what does that segmented data mean? Segments cast a wide net across your Google Analytics data. Segments say: “Show me the data for all the sessions where X happened.” What you get is X, and everything else that happened in those sessions, too. For example: If you ask for sessions where your new page was viewed, you will get data about that page, and also any other pages and events in sessions with your new page. One of those other pages or events might be a goal completion. 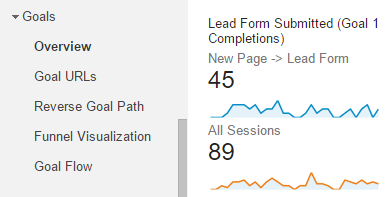 And look, it happened in 46 sessions – users viewed the new page and submitted a lead form. So close! And yet so far from what you want. What the segment didn’t tell you (because you didn’t ask) is whether or not your new page was viewed BEFORE the goal completion. If the new page was viewed after the goal completion, clearly it’s not driving that conversion. The tool for this job is a sequence segment. Sequence segments say: “Show me the data for all the sessions where X happened, and then Y (e.g. a goal completion) happened later.” You specify conditions for each step, and each step must occur in order. For example: You can create a sequence segment where one step is a user sees your new page, and a later step is the user submits a lead form. 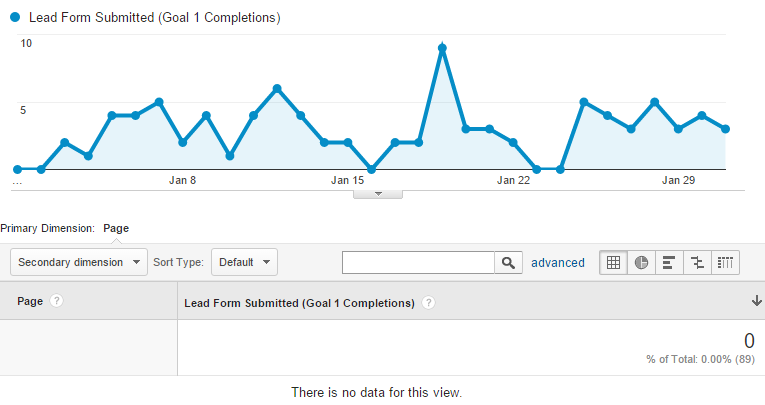 Now you can see how much the new page affects conversions by applying that segment across reports in Google Analytics. In the Goals > Overview we now see only 45 conversions, instead of 46. That means one of the 46 conversions occurred before the new page was viewed. It didn’t match the sequence segment. Suppose you want to know what brought users to your site when the first page they saw was your new page, and then later they submitted a lead form. Sequence segments can do that, too. How Does the Sequence Start? 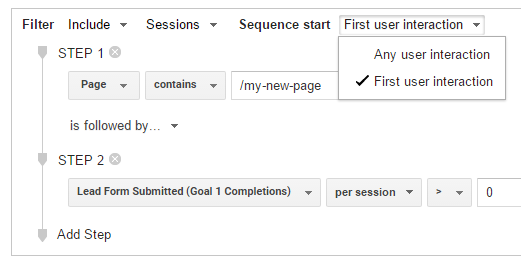 Choose either “Any user interaction” or “First user interaction” to get more specific about how your sequence begins. When you specify “First user interaction” you see what external sources brought users to your new page before they submitted a lead form. Subtract these conversions from those for “Any user interaction” and compare the two numbers. Are users submitting lead forms more when the new page is first? Then it could be that sources pointing to your new page are already bringing better-qualified users, and not the new page that’s influencing users to submit the lead form. Let’s switch examples and see another way sequence segments help you ask for precisely what you want. Suppose you want to know about this month’s home page banner. Is it driving free trial sign-ups? You don’t care if the home page banner is the first thing the user sees or clicks, but you want to know if the user clicks the banner then do they immediately sign up for a free trial? How Strict is the Sequence Order? A step is either: “followed by” or “immediately followed by” the next step. When you specify “immediately followed by” you see only conversions that occurred without any other pages or events in between the home page banner click and the free trial sign-up. Suppose your home page banners are not immediately driving users to sign up for the free trial. Is it possible that users who click the banner are coming back and converting later, in another session? Up to now we’ve been talking about a sequence that happens in the same session. 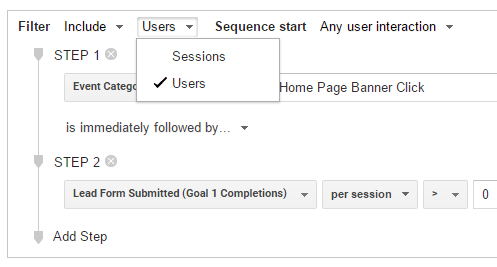 To ask for a sequence that occurs across more than one session, switch the segment filter from sessions to users. A user sequence segment looks across sessions for the same user, and will match steps in your sequence even if they occur in different sessions. Now you can see if those banners may have a longer-term impact on free trials. One caveat: Your date range must be 90 days or less. Both of my examples had 2 steps, but you can have up to 10 steps in a sequence. You can also specify multiple sequences in the same segment. So if I wanted to see how home page banners are driving free trial sign-ups for a specific group of users (defined by another sequence), I could. 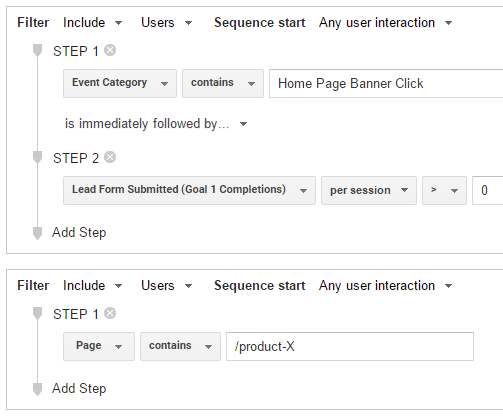 For example: You can create a sequence segment where one sequence is “user clicks home page banner followed by a free trial sign-up” and another sequence is “user searches for products followed by view of product X”. And you can define any “sequence” as a single step. In my multi-sequence example, the second sequence could simply be “view of product X”. Single-step sequence segments are also useful for making sure that event dimensions occur in the same hit. Otherwise you could match the event category from one hit with the event action in another hit – which is easy to do when your event categories share the same generic values for their event actions such as “Click” or “Yes/No”. Use sequence segments to ask more precise questions and get more accurate answers, especially when it comes to conversion data. Get the data for all the sessions where X happened, and then a goal completion happened later. 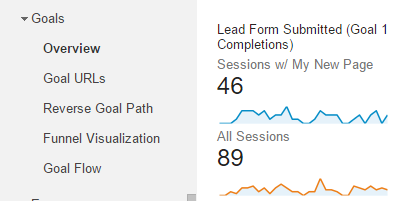 Get more insight from goal data in the Google Analytics reports for Audience and Acquisition. Specify what happens before a sequence and between steps of a sequence. Use multiple sequences in one segment when some user actions can occur in any order, not part of the original sequence. Single-step “sequences” are allowed, and in fact are recommended for matching multiple event dimensions. Have you used sequence segments for conversion data? Are some sequences more challenging to define? What other ways have you used sequence segments? Please share in the comments.